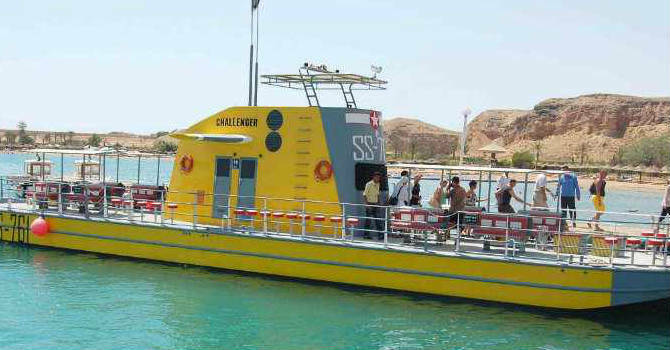 Book Seascope Submarine Sharm El Sheikh Trip. Sharm Family Excursion to Explore Red Sea Coral Reef & Colored Fishes. Book Sindbad Semi Submarine Sharm El Shiekh Tours. For One Hour, It Departs Hourly From Your Hotel With Return Transfer Included. Explore the wonders of the Red Sea without getting wet ! you do not need to be scuba diver or swimmer to book this trip. We will pick you up from your hotel in Sharm El Sheikh at your selected time then transfer with private modern van for 20 minutes to Sharm Dock, board the Semi Submarine to relish this amazing underwater experience. The Submarine enjoys large panoramic windows that allow you stunning view of the coral reef, fish collections and other marine types. This activity is an ideal way for families and sea lovers to admire the Red Sea without getting their feet wet. The air-conditioned atmosphere with swivel chairs & clear enough view for photography will guarantee the ultimate sea experience for about one hour then we transfer you back to hotel. Book Mount Sinai Sharm El Sheikh Trip. Mount Sinai Tour From Sharm El Sheikh to St Catherine & Hiking Moses Mountain Overnight From Sharm El Sheikh to Mount Sinai. Experience The Amazing Sunrise View From The Top of Mt Sinai & Explore The Orthodox Monastery of St. Catherine. Safari Sharm El Sheikh Trip, Sharm El Sheikh Quad Tour Takes You into Sinai Desert. Book Beach Buggy Sharm El Sheikh & Meet Bedouins With Quad Biking Sharm El Sheikh Trip For 2 Hours Runs Every Day. Exceptional Chance to Experience Sinai Desert. Sinai adventure camel back ride trip in Sharm runs evey day for your hotel with private return transfer. An interesting time in desert with Bedouins, relishing the open buffet dinner with star gazing in Sinai clear skies. Book Luxor Tour From Sharm El Sheikh By Plane. Sharm El Sheikh to Luxor Trip to Valley of the Kings, Karnak & Luxor Temples. Sharm El Sheikh Luxor Air Excursion to Explore The Tourist Attractions on The Nile Banks in Ancient Thebes. Book Petra Tour From Sharm El Sheikh. Sharm El Sheikh to Petra Day Trip to Great Treasury, Qasr El Bent and Siq Canyon. Sharm El Sheikh Petra Excursion By Ferry Boat is Great Activity to Maximize Sightseeing While Holidaying in Sharm. Book Sharm El Sheikh to Pyramids Trip. Sharm El Sheikh Pyramids Excursion to Cairo, Egyptian museum and Old Cairo. Private Cairo Tours From sharm El Sheikh By Plane Every Day Departure With Professional Guide and Return Flight Ticket. Dahab & St Catherine's Monastery Full Day Tour With Lunch. Book Sharm El Sheikh to St Catherine Monastery, Moses Mountain & Dahab. Private St. Catherine Tour From Sharm El Sheikh Available From Your Hotel in Sharm With Pickup and Drop Off. Sinai grand safari excursions from Sharm El Sheikh to relish the beauty of Sinai Colored Canyon with 2 hours hiking, you will also visit the monastery of St. Catherine and Moses mountain. Book Sharm El Sheikh to Cairo Trip. Overnight Cairo Tours From Sharm to Giza Pyramids, Egyptian Museum and Old Cairo. 2 Days Sharm El Sheikh Cairo Private Tour By Plane With Flexible Schedules. Book Cairo and Luxor Tour From Sharm. 2 Day Air Trips to Cairo and Luxor From Sharm El Sheikh, Book Air Tour to Cairo & Luxor From Sharm to Cairo, Giza Pyramids, Egyptian Museum, Karnak, Luxor Temples and Valley of The Kings.